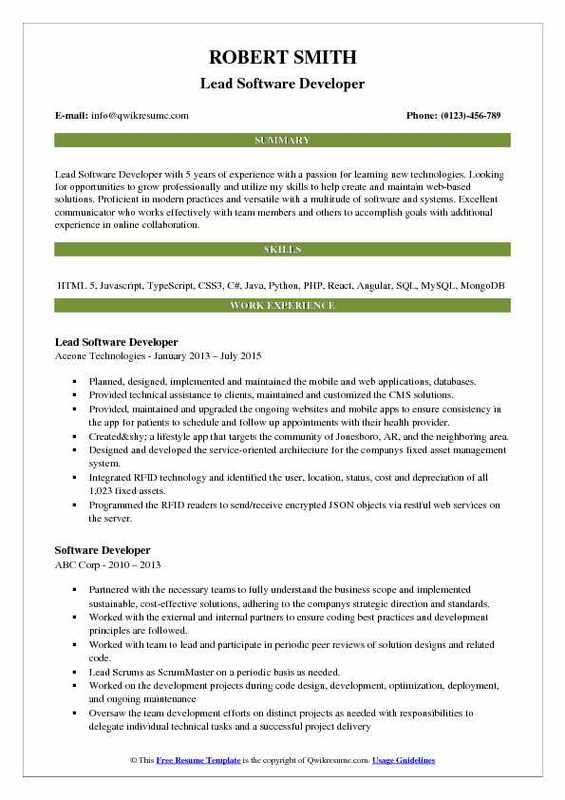 Lead Software Developers take charge of developing web and computer applications. 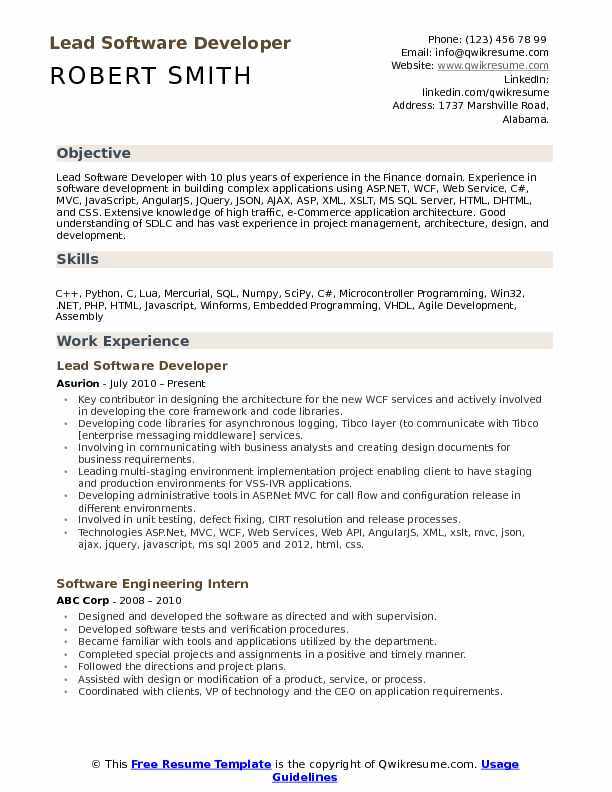 Lead Software Developer Resume highlights job duties such as – developing and testing software programs, involving in design planning and scheduling release dates, involving in product committees, implementing high-quality codes, creating detailed software development plans, performing scalability and performance analysis, solving technical issues, testing products, training users and writing codes. Key contributor in designing the architecture for the new WCF services and actively involved in developing the core framework and code libraries. Developing code libraries for asynchronous logging, Tibco layer (to communicate with Tibco [enterprise messaging middleware] services. 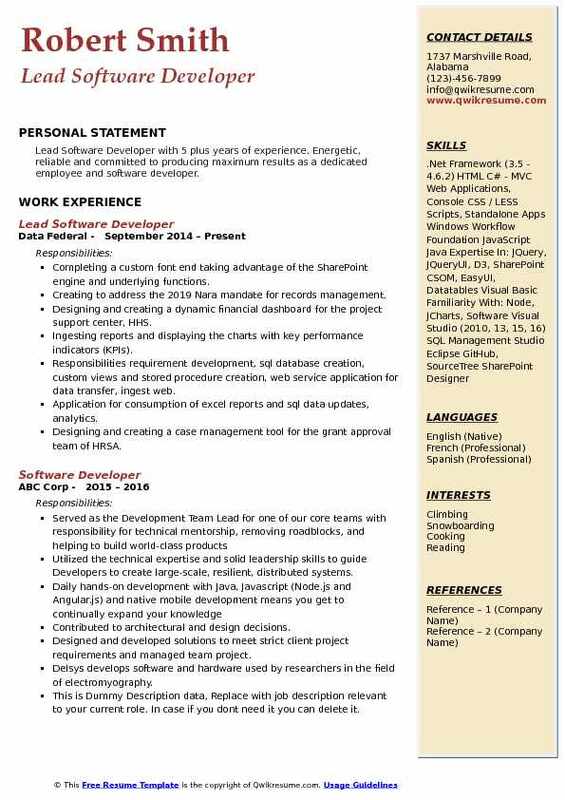 Involving in communicating with business analysts and creating design documents for business requirements. Leading multi-staging environment implementation project enabling client to have staging and production environments for VSS-IVR applications. Developing administrative tools in ASP.Net MVC for call flow and configuration release in different environments. Involved in unit testing, defect fixing, CIRT resolution and release processes. Lead team to maintain the internal web portal and HT website, Desk tracking system(DTS) design and developed to automate the desk and resources allocations. Effectively communicating with the HR, admin and system teams to understand the requirements and executed the project. Summary : Lead Software Developer III with an extensive experience of 18 years in software development for various business applications. Proficient in analysis, design, development, implementation, maintenance of databases, and coding programs on the iSeries and PC. Creating restful (representational state transfer) API running on Iseries that allows the clients to submit orders, request an inventory file, and request a shipping feedback. Created a GUI order management web application running on Iseries that allows maintaining orders, tracking inventory, order history, customer information, and using invoices analysis tools over the internet. Creating a PC-application for integrating with proprietary FedEx and USPS (Endicia) software. Using web services based on Iseries. This application sends shipping data over the internet to remote clients and receives feedback to the Iseries server. Developing program utilities to retrieve remote orders and send required feedback from different shopping carts (Amazon, Yahoo, eBay, etc. ) using FTP, web services, and auto receiving. Developing an embedded iseries email system based on the javamail package that sends reports in pdf, csv, or xml formats by end user requests or automated by an iseries system job. Headline : Lead Software Developer with 5 years of experience with a passion for learning new technologies. 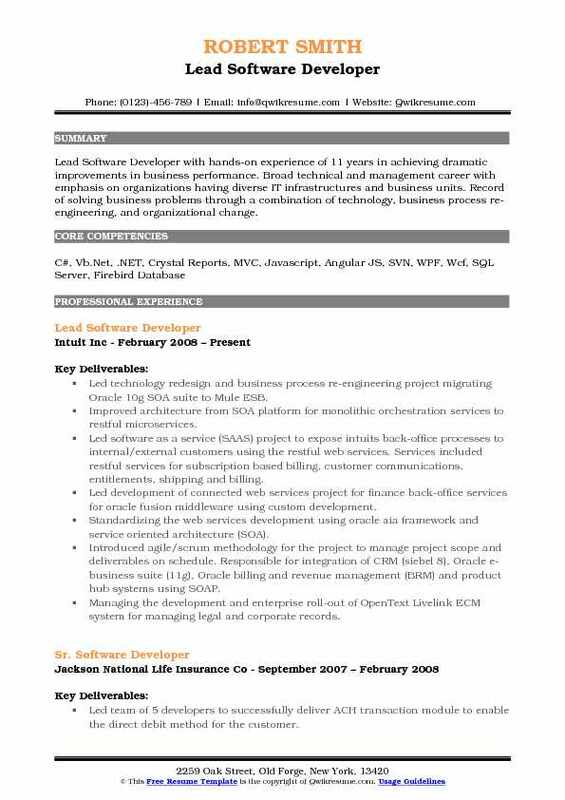 Looking for opportunities to grow professionally and utilize my skills to help create and maintain web-based solutions. 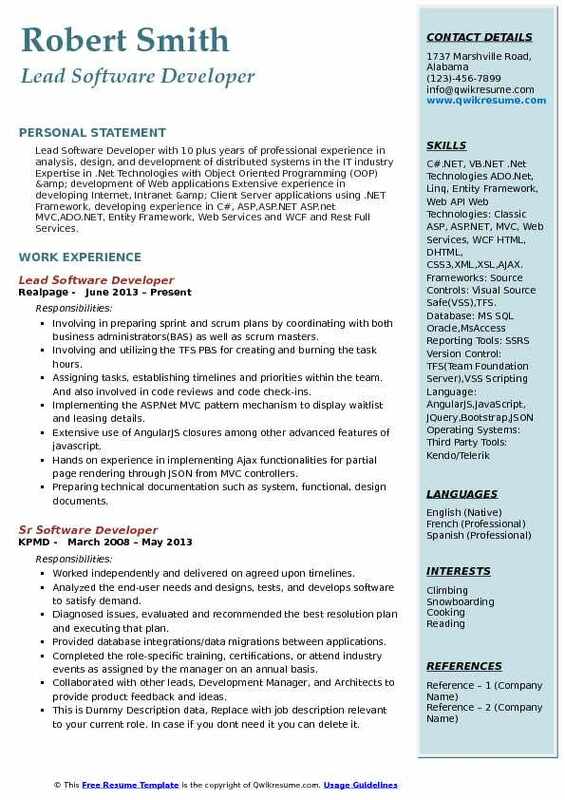 Proficient in modern practices and versatile with a multitude of software and systems. Excellent communicator who works effectively with team members and others to accomplish goals with additional experience in online collaboration. Planned, designed, implemented and maintained the mobile and web applications, databases. Provided technical assistance to clients, maintained and customized the CMS solutions. Provided, maintained and upgraded the ongoing websites and mobile apps to ensure consistency in the app for patients to schedule and follow up appointments with their health provider. Created­ a lifestyle app that targets the community of Jonesboro, AR, and the neighboring area. Designed and developed the service-oriented architecture for the company's fixed asset management system. Integrated RFID technology and identified the user, location, status, cost and depreciation of all 1,023 fixed assets. Programmed the RFID readers to send/receive encrypted JSON objects via restful web services on the server. Accelerated the time needed to perform a physical fixed asset audit from five hours to about eight minutes per site. Discovered several cross site scripting vulnerabilities in the companys erp system and demonstrated a solution. 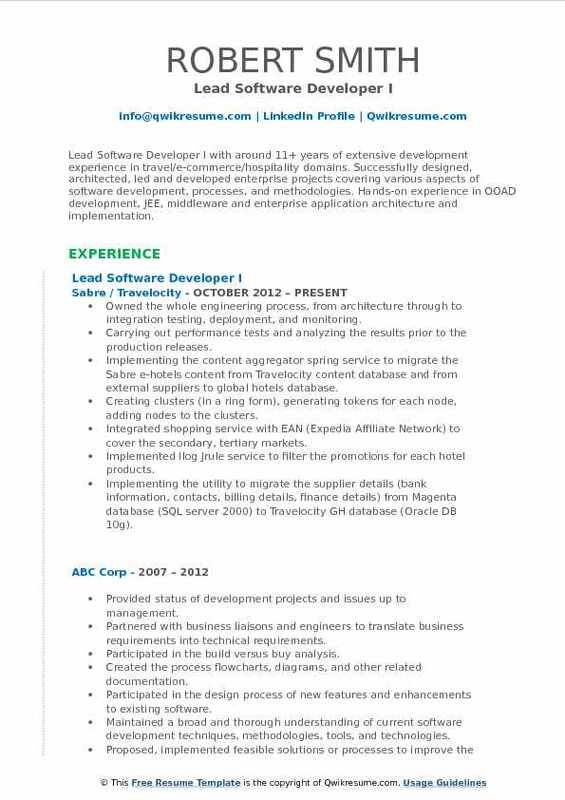 Summary : Lead Software Developer I with around 11+ years of extensive development experience in travel/e-commerce/hospitality domains. Successfully designed, architected, led and developed enterprise projects covering various aspects of software development, processes, and methodologies. Hands-on experience in OOAD development, JEE, middleware and enterprise application architecture and implementation. Owned the whole engineering process, from architecture through to integration testing, deployment, and monitoring. Carrying out performance tests and analyzing the results prior to the production releases. Implementing the content aggregator spring service to migrate the Sabre e-hotels content from Travelocity content database and from external suppliers to global hotels database. Creating clusters (in a ring form), generating tokens for each node, adding nodes to the clusters. Integrated shopping service with EAN (Expedia Affiliate Network) to cover the secondary, tertiary markets. Implemented Ilog Jrule service to filter the promotions for each hotel products. Implementing the utility to migrate the supplier details (bank information, contacts, billing details, finance details) from Magenta database (SQL server 2000) to Travelocity GH database (Oracle DB 10g). Implemented the descriptive content pages to load the hotel rich content by global hotels ops/suppliers in extranet web tool. Implemented a function to generate the hotel bookings as a pdf report with different booking status codes which is required for business and audit purpose and integrates to the global hotel's extranet web tool when the internal marketing managers can access. Summary : Lead Software Developer with 10 plus years of professional experience in analysis, design, and development of distributed systems in the IT industry Expertise in .Net Technologies with Object Oriented Programming (OOP) & development of Web applications Extensive experience in developing Internet, Intranet & Client Server applications using .NET Framework, developing experience in C#, ASP,ASP.NET ASP.net MVC,ADO.NET, Entity Framework, Web Services and WCF and Rest Full Services. Involving in preparing sprint and scrum plans by coordinating with both business administrators(BAS) as well as scrum masters. Involving and utilizing the TFS PBS for creating and burning the task hours. Assigning tasks, establishing timelines and priorities within the team. And also involved in code reviews and code check-ins. Implementing the ASP.Net MVC pattern mechanism to display waitlist and leasing details. Hands on experience in implementing Ajax functionalities for partial page rendering through JSON from MVC controllers. Preparing technical documentation such as system, functional, design documents. Implementing the design patterns and the entire backend of the application in c#. Net, using various object-oriented features like inheritance, polymorphism. Coordinating the workflow between the graphic designers, the HTML coder. Summary : Lead Software Developer II with a proven track record 18 years of a competent, organized and knowledgeable employee in a fast-paced development environment. Ability to manage multiple complex projects for internal and external customers. Innovative and creative problem solver, who is results-oriented, has an aptitude for learning and can maximize resources while possessing a sense of urgency. Responsible for the design, release, and maintenance for 8 complex U.S department of state HR applications. Developing U.S DOS HR applications using Visual Studio C#.Net framework, Java, XML, and SQL. Performing the design and maintenance of SQL Server databases for several applications. Performing the development of applications using the agile framework life cycle. Creating SQL scripts to update previously released application databases in production. Responsible for the design & maintenance of databases for applications developed at Geneva Software Inc. Assisting the application developers in solving their database problems and concerns. Creating the logical and physical data models for projects using Erwin software. 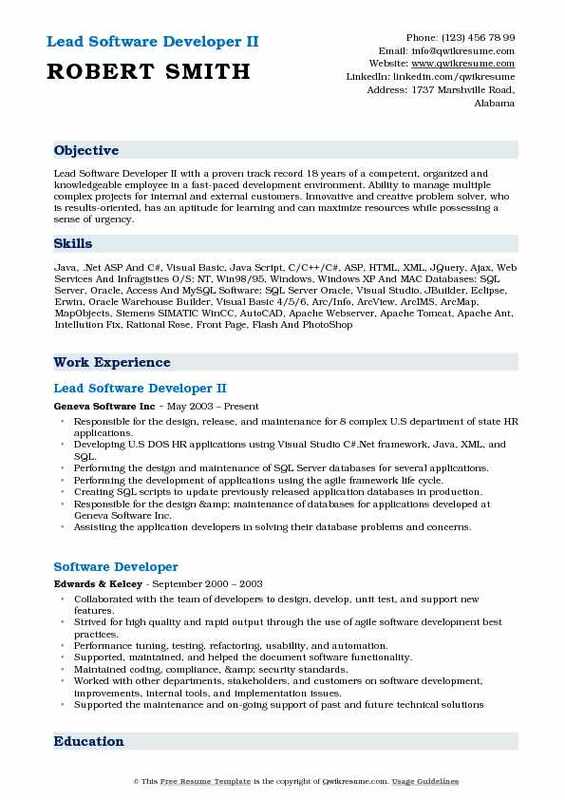 Responsible for the development and maintenance of 4 complex systems at Geneva Software Inc.
Summary : Lead Software Developer with 13+ years of experience in designing, developing, testing, and implementing Oracle backend based client-server software products for Pharmaceutical industry. Systematic design, development, and implementation of Oracle software and API according to requirements specifications. 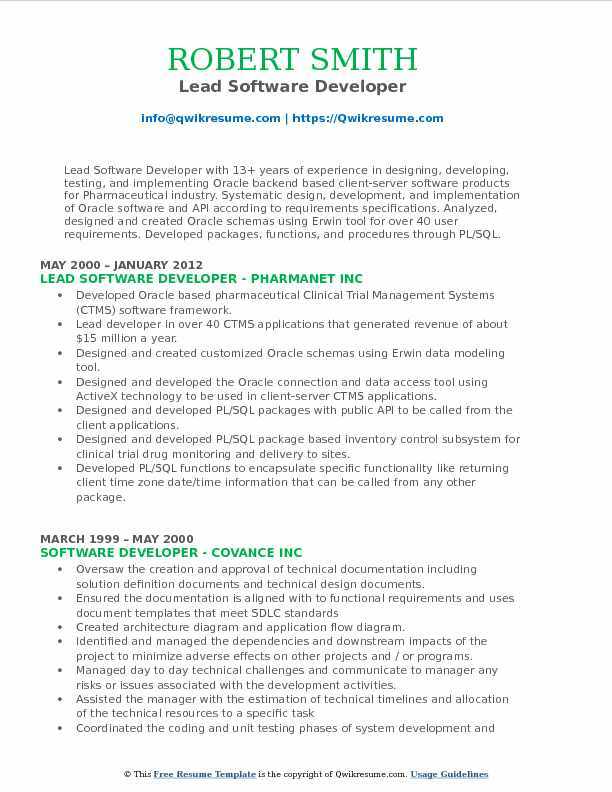 Analyzed, designed and created Oracle schemas using Erwin tool for over 40 user requirements. Developed packages, functions, and procedures through PL/SQL. Developed Oracle based pharmaceutical Clinical Trial Management Systems (CTMS) software framework. 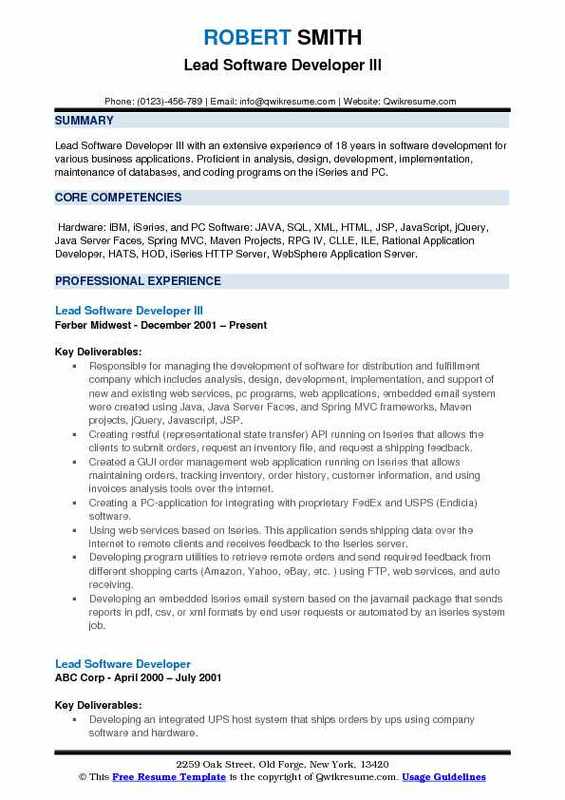 Lead developer in over 40 CTMS applications that generated revenue of about $15 million a year. Designed and created customized Oracle schemas using Erwin data modeling tool. Designed and developed the Oracle connection and data access tool using ActiveX technology to be used in client-server CTMS applications. Designed and developed PL/SQL packages with public API to be called from the client applications. Designed and developed PL/SQL package based inventory control subsystem for clinical trial drug monitoring and delivery to sites. Developed PL/SQL functions to encapsulate specific functionality like returning client time zone date/time information that can be called from any other package. Performed SQL tuning to optimize the data retrieval time through optimizer hints and table access order. Setup Oracle jobs to execute specific tasks like inventory runs at the specific time of the day. Developed SQL loader scripts to load clinical data into Oracle tables. Developed test plans, application setup procedures, and application operational manuals. Provided technical support to users and system administrators by troubleshooting issues in critical clinical trial software. Summary : Lead Software Developer with hands-on experience of 11 years in achieving dramatic improvements in business performance. Broad technical and management career with emphasis on organizations having diverse IT infrastructures and business units. Record of solving business problems through a combination of technology, business process re-engineering, and organizational change. Led technology redesign and business process re-engineering project migrating Oracle 10g SOA suite to Mule ESB. Improved architecture from SOA platform for monolithic orchestration services to restful microservices. Led software as a service (SAAS) project to expose intuits back-office processes to internal/external customers using the restful web services. Services included restful services for subscription based billing, customer communications, entitlements, shipping and billing. Led development of connected web services project for finance back-office services for oracle fusion middleware using custom development. Standardizing the web services development using oracle aia framework and service oriented architecture (SOA). Introduced agile/scrum methodology for the project to manage project scope and deliverables on schedule. Responsible for integration of CRM (siebel 8), Oracle e-business suite (11g), Oracle billing and revenue management (BRM) and product hub systems using SOAP. Managing the development and enterprise roll-out of OpenText Livelink ECM system for managing legal and corporate records. Headline : Lead Software Developer with 5 plus years of experience. Energetic, reliable and committed to producing maximum results as a dedicated employee and software developer. Completing a custom font end taking advantage of the SharePoint engine and underlying functions. Creating to address the 2019 Nara mandate for records management. Designing and creating a dynamic financial dashboard for the project support center, HHS. Ingesting reports and displaying the charts with key performance indicators (KPIs). Responsibilities: requirement development, sql database creation, custom views and stored procedure creation, web service application for data transfer, ingest web. Application for consumption of excel reports and sql data updates, analytics. Designing and creating a case management tool for the grant approval team of HRSA. 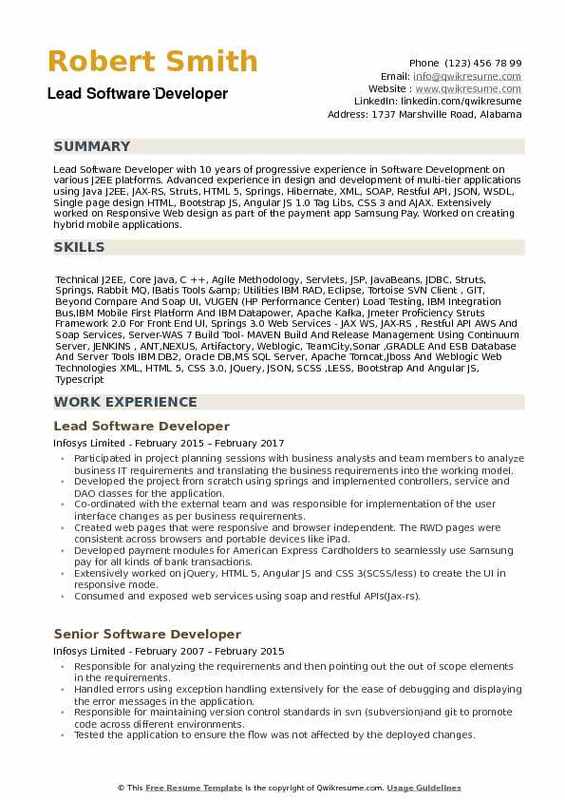 Summary : Lead Software Developer with 10 years of progressive experience in Software Development on various J2EE platforms. Advanced experience in design and development of multi-tier applications using Java J2EE, JAX-RS, Struts, HTML 5, Springs, Hibernate, XML, SOAP, Restful API, JSON, WSDL, Single page design HTML, Bootstrap JS, Angular JS 1.0 Tag Libs, CSS 3 and AJAX. Extensively worked on Responsive Web design as part of the payment app Samsung Pay. Worked on creating hybrid mobile applications. Participated in project planning sessions with business analysts and team members to analyze business IT requirements and translating the business requirements into the working model. Developed the project from scratch using springs and implemented controllers, service and DAO classes for the application. Co-ordinated with the external team and was responsible for implementation of the user interface changes as per business requirements. Created web pages that were responsive and browser independent. The RWD pages were consistent across browsers and portable devices like iPad. Developed payment modules for American Express Cardholders to seamlessly use Samsung pay for all kinds of bank transactions. Extensively worked on jQuery, HTML 5, Angular JS and CSS 3(SCSS/less) to create the UI in responsive mode. Consumed and exposed web services using soap and restful APIs(Jax-rs).